4 DIY kitchen projects to make from leftover wallpaper - HMS National, Inc.
Have an extra roll of wallpaper lying around from your last big home improvement project? Don't throw it out. Repurpose it with one of these four do-it-yourself kitchen projects. Happy decorating! Not sure what to do with old plates? Combine them with your leftover wallpaper to make pretty little pieces of art that you can display above the sofa, in the bathroom or along the staircase. Simply trim the wallpaper so it precisely matches up with the size of the plate. Use a glue gun or other adhesive to attach it to the plate. Stick it to the wall using either two-sided tape or a self-adhesive hook. Most people have a fridge or freezer that's been running far beyond its life expectancy. These appliances are perfect for storing ice and large quantities of frozen foods, but they tend to look pretty run down after all those years. Spruce up an old fridge or freezer by covering it in funky wallpaper. Aunt Peaches blog summarized the perks of this project. It looks great. 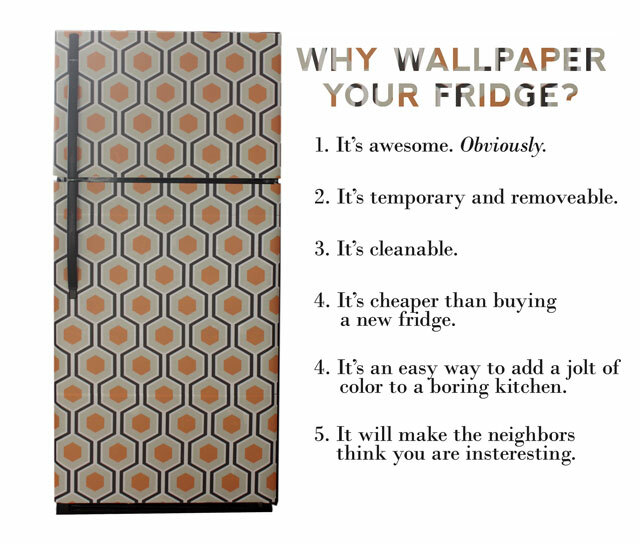 The wallpaper is easy to clean and it's a great alternative to buying a new fridge. Cork tiles (which will be the actual placemat). Once you have the aforementioned materials, use the blade to cut the tiles into whatever shape you want your placemats to be. Use the ruler for a more precise measurement. Apply a thin layer of PVA glue then place the wallpaper over the tiles. Press down firmly, then set the mat aside to dry. In a few short hours, you'll have some lovely table mats. Sometimes the smallest touches can make a house feel more like a home. Line your dull silverware drawer with wallpaper so every time you reach for a spoon, you'll see the pretty decor. A Cultivated Nest blog explained that decoupaging is quick and easy! The blog suggested using double-stick tape, Mod Podge or any other adhesive to attach the wallpaper to the drawer. Use Mod Podge if you're going for a more permanent display, as it's tougher to remove. Then, enjoy your pretty new kitchen drawer!